The specialty used auto-things market is booming because we live in interesting/revolutionary times. First there was that Porsche 911 RSR manual booklet that sold for $6,000, and now you can bid on a long-forgotten hood piece reportedly off of a 1989 Ferrari F40. The front right corner of the clamshell style hood made of kevlar and carbon fiber was damaged once upon a time (how? 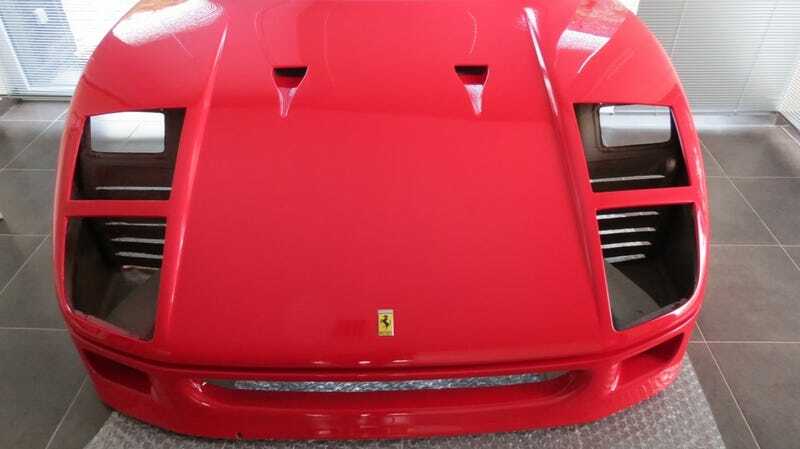 Who can say, I wouldn’t worry about it) and removed from its original 1989 Ferrari F40, chassis number 83505, according to the listing over on Bring A Trailer. Evidently the hood was repaired but sat in storage for nearly 30 years, before being acquired by the current seller around five years ago. At some point the hood was repainted Rosso Corsa. It still has the potential to serve as a functional hood, with the air intakes, hood ducts, and housings for the pop-up headlights all ready to get back to work. Additionally, it still has the badge on the front, but no longer has the mounted badges, nor a black lip spoiler that should be there, and some additional trim pieces are missing, according to the listing and images. There’s still a crack in the underside of the hood, some overspray and a few paint imperfections, and once the bidding ends you can come pick up your one (1) F40 hood at the owner’s location in Belgium. If that’s too much for you, they’ll also ship it in, the listing specifies, a wooden crate. I hope your Pontiac Fiero F40 body kit is ready for some legitimacy. I also feel like a table would be too obvious, but a nice water feature with a fountain flowing down the hood could be tasteful.